They say I must be put to death for what happened to Madame, and they want me to confess. But how can I confess what I don't believe I've done? 1826, and all of London is in a frenzy. Crowds gather at the gates of the Old Bailey to watch as Frannie Langton, maid to Mr and Mrs Ben... read full description below. They say I must be put to death for what happened to Madame, and they want me to confess. But how can I confess what I don't believe I've done? 1826, and all of London is in a frenzy. Crowds gather at the gates of the Old Bailey to watch as Frannie Langton, maid to Mr and Mrs Benham, goes on trial for their murder. The testimonies against her are damning - slave, whore, seductress. And they may be the truth. But they are not the whole truth. 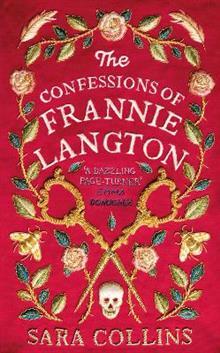 For the first time Frannie must tell her story. It begins with a girl learning to read on a plantation in Jamaica, and it ends in a grand house in London, where a beautiful woman waits to be freed. But through her fevered confessions, one burning question haunts Frannie Langton: could she have murdered the only person she ever loved? Sara Collins is of Jamaican descent and worked as a lawyer for seventeen years in Cayman, before admitting that what she really wanted to do was write novels. She studied Creative Writing at Cambridge University, winning the 2015 Michael Holroyd Prize, and began to write a book inspired by the idea of 'writing a Gothic novel where the heroine looked like me'. This turned into her first novel, The Confessions of Frannie Langton.